MEYTEC develops and implements telemedicine solutions for daily use by doctors and nursing staff in teaching and/or general hospitals as well as in multi-professional medical supply centers. The scientific and development activities are constantly performed through close cooperation with the medical and /or scientific early adopters. MEYTEC has invested heavily in resources, including people, workshops and laboratories, primarily for the mechanical, electro-technical, electronic and software development. Just after the turn of this millennium, MEYTEC as a technological provider implemented an innovative supply concept TEMPiS. A telemedicine project aimed at the establishment of an integrated stroke care service in the area of the South-East Bavaria. The specialist’ expertise from the supraregional stroke-units is provided to the local hospitals via telemedicine within the network. Consultation from experienced neurologists is available to local hospitals around the clock. A 27/4 technical support hotline provides a high availability of the teleneurological expertise. The VIMED® solutions are a part of an international success story, deployed in Germany. The VIMED® product family by MEYTEC is a comprehensive range of efficient solutions for the transfer, visualization, diagnostic findings or storage of medical audio, video and image data within the hospital network accessible via intranet or internet. 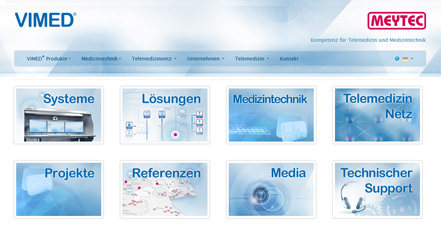 More information on the homepage of MEYTEC GmbH Medizinsysteme. The telemedicine system MEYDOC® is a comprehensive solution for secure video consultations in the health care. Ensuring optimum data security, the concept allows that all confidential data of video consultations is available for the doctor and their patient only. MEYDOC® is predestinated for deployment in different pre- and post-hospital medical scenarios, that can benefit from the effective support via audiovisual communication.